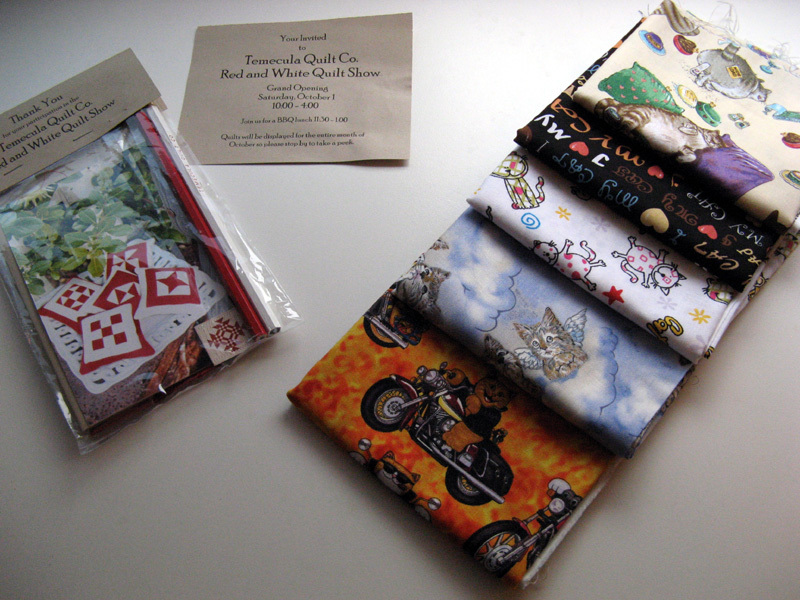 Here are the fabrics for Kourageous pansy block. I've had some time to work on the individual sections of which there are 23 total (A to W). Monday while I was paying more attention to DWTS (Dancing With The Stars) for two hours...I got though the D section. Thought I would have gotten further, but progress still :)! By the end of yesterday, another TV night with DWTS again my primary attention...I got through the G section. Unfortunately paying more attention to DWTS had me reversing some stitches on G! I put the wrong fabric in 3 places. Fortunately they were on the outsides so the ENTIRE piece didn't have to be done again. Referring to the picture the finished sections starting at top right (1 o'clock) and moving towards the bottom (6 o'clock) are A through G Sections. The part of the pattern these sections will become is the flower you can see that is white and purple (top left). I'm hoping to get some more sections done tonight, without distraction! By the way no surprises on the first two eliminations of DWTS. Hope to see you back here on Friday when I post my completed September 2011 UFO Kourageous pansy block. Let's start with what I should have worked on today and then...what I did :(! 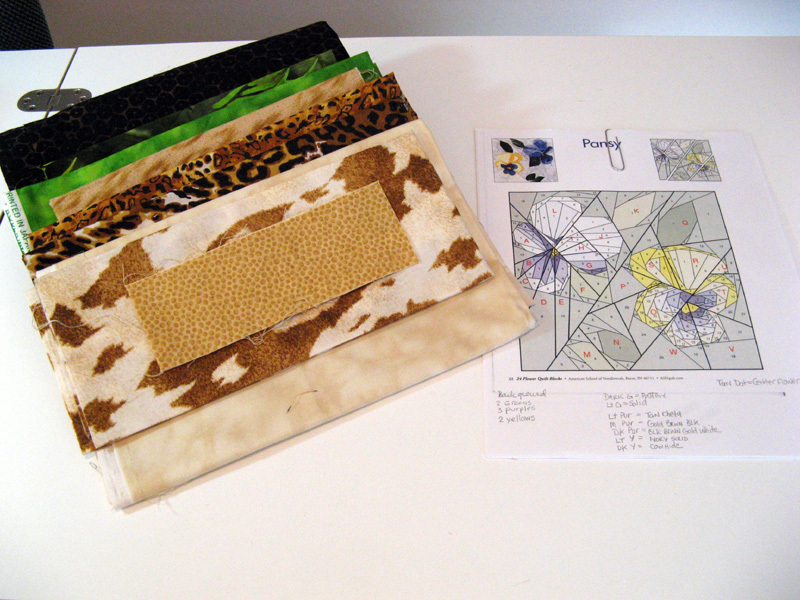 I did select the fabrics that will make the Kourageous pansy block, but absolutely no sewing. For the block I will need the background, two greens for leaves, three fabrics that appear in the drawing as purple, two fabrics that appear in the drawing as yellow, and last a fabric for the centers of the two flowers. I've stacked them in the order I just laid out. Tomorrow is another sewing day :)! I did assemble the Sunshine Quilt Guild's September BOM. The stem is a bit tricky. I couldn't get the "sliver" to turn so Plan B came into affect. I positioned it as it should be and then sewed it into the seam as it should finish and appliqued the tiny piece into place. With the due date not till October 11 I'm way ahead. Kolonial has my attention. I want to get this project done. I need to report something besides purchased on my Sunday Stash Report. It does go together fast. The first four rows are what I've got to assemble from all the pieces. Row 1 requires three, Row 2 requires three, Row 3 requires seven, and finally Row 4 requires 2. None of these rows are complete. There are several more blocks to add to each row. This quilt is a biggie finishing at 84.5 x 96.5 when finished. 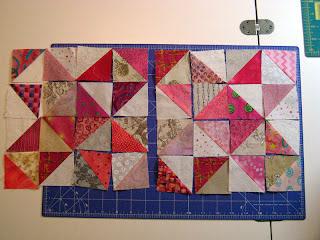 There is a 2" Border 1 and a 5" Border 2 that is pieced included in the finished size. 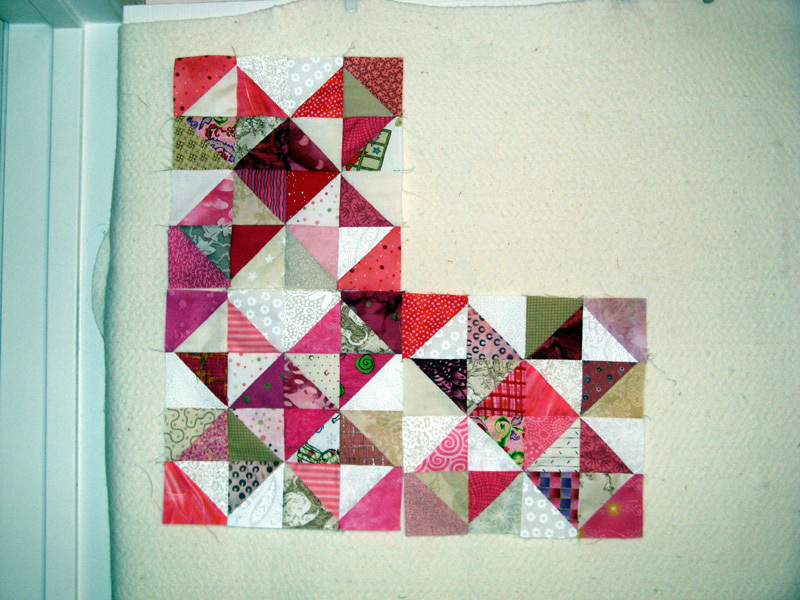 The four blocks on the bottom two rows are what is done so far to continue Rows 1 and 2. 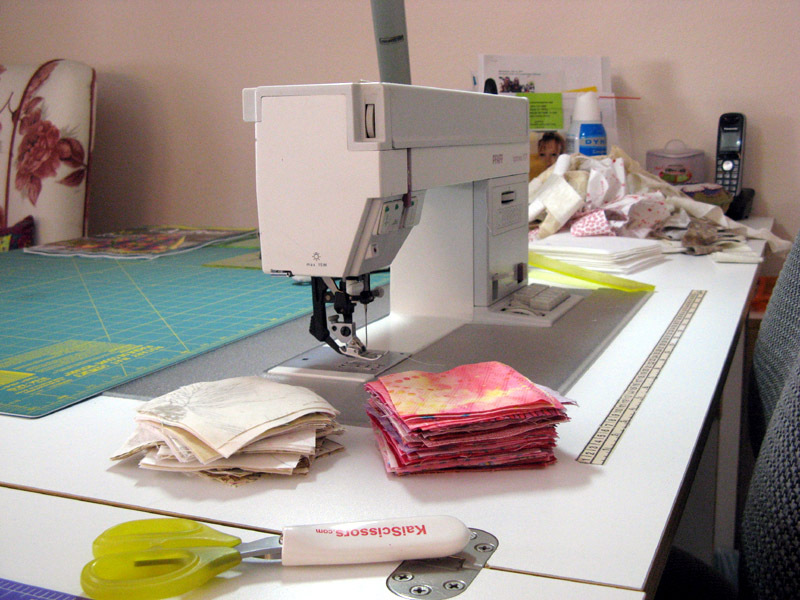 Hope you've been having fun in your sewing studio. I just love to see what everyone else is working on. 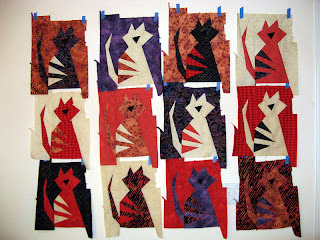 Take some time to see other quilters work at Patchwork Times. Darn the weekend is going way too fast. Two day weekends which is what I had for years just don't compare against the three day weekends that I get bimonthly these days. Funny that I wasn't sure I could live with the Off Friday every other week...just couldn't imagine not being at work five days every week. NOW I can't wait for them; got one coming this week! YIPPEE! Since my last post on Thursday all 12 cats are finished. Check one off the to do list! Next to check off is my September UFO the pansy block that's part of Kourageous. I'm most fond of the pansy flower over any other flower, but OMG this design is incredible. I'm working on this today. I WILL have it done before the day is finished...you can help me by keeping your fingers and toes crossed that I'm successful. If things don't go well today I've still got most of the week to get through it. This block is not the pansy as you can see, it's the iris that I corrected. Look back to previous posts. Do you see my mistake? I didn't make as much progress as I'd hoped yesterday on Kolonial. I do have a few dark stars (sounds like a sci-fi program) assembled, but still a ways to go. 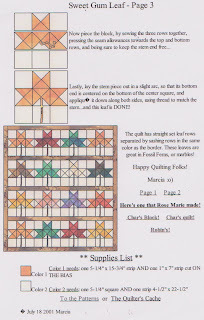 I'm starting to ponder my quilting thread color and design. Kerry is all lined up to get this one quilted just as soon as I'm ready. Memory Lane Quilt Shop got some business from me on Saturday. My Mom had me shopping for a back for a Bonnie Hunter project she finished up. She's so lucky to have her giving a lecture and two day workshop in her area the second weekend of October. Show and Tell, with a little luck, will have Mom's quilt displayed when Bonnie visits. What started out being a pink backing has turned into white, black, and gray. I fought hard to go the pink, but just couldn't make it work in my mind. Next I thought a teal thread would be the way to go...but that changed too. Mom...are you ready? It is going to be fabulous with the quilt design I selected that matches the paisley in the border. 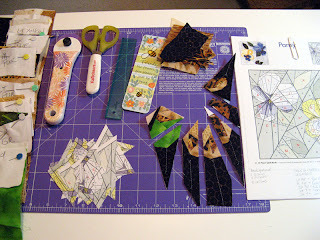 I'm all cut and ready to sew on Sunshine Quilt Guild's Setpember BOM. Thought I'd throw in a blue/rust color Fall batik. Notice how similar this background is to the Memory Lane purchase? Love it! My stash report suffered from my Memory Lane visit; Mom it's all your fault for taking me to Memory Lane! They had a must get neutral as their bolt of the day. (You must have a nearby quilt shop that does this too.) 20% off a batik neutral...come on how can it be resisted? This week with a purchase my Net Fabric Used in 2011 takes a bit of a dive. Got to get Kolonial done! Check out others using their stash at Patchwork Times. Have a quilty week everybody! My Crazy Cats project is moving forward. Eight are done and two to go! If you take a Buggy Barn workshop from Julanne she'll give to you your very own pizza box. She's found it convenient to store Buggy Barn pattern pieces while you are working on the project. You put your master at the bottom and then stack your individual fabric pieces together placing them in the correct locations according to the master. 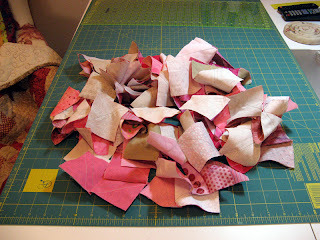 When you sew each block you'll take pieces from the top layer and sew together. If you need to stop and store you pin the individual fabric pieces together close the lid and DON'T shake! When you are ready to sew again you remove the pins and you are right back where you need to be. If you try this make sure you get the biggest "clean" pizza box you can find OR come to one of Julanne's workshops :)! Next Thursday is the second part of the workshop. We'll be working on the flowers and the cute mouse border that Julanne includes that is not part of the published pattern; wait till you see how cute these are. Yesterday my spider had to build a new home...with time to spare I received the wool that I ordered from Primitive Gatherings. The redish orange on the left will be for Kit Kat Mama and probably one of her kittens (there are three). The ivory is for another kitten and I already have two other black pieces I'm considering for kitty three. Wish I had the pattern to share with you now; I'll be getting it soon. The class is October 7th at the Country Loft in La Mesa, CA. I really like the blue wool; it will potentially be used for clothing that these cats will be "dressed" in. The other two maroon and green will find a way into this project along with lots of scraps I have from making Kevin and Koraline (two earlier projects). Haven't decided on names for Mama and her three kittens...of course all four must be "K" names. Hmmm...what is a good name for a Mama? Klaudine comes to mind...need a name like Alice (which was my Grandma's) or perhaps Thelma maybe...don't know why Thelma came to mind! I found an error that I couldn't live with on my August UFO completion, the Iris block for my Kourageous project. I put my Clover seam ripper to several very tiny stitches and carefully removed the two pieces. I used the wrong color fabric in both of these locations which fortunately were two outside pieces; do you see them? I know if I'd left them wrong it would have driven me crazy so the undesirable deed was accomplished. Much happier now that its right. I also have all 23 paper pieces cut for the sewing to start on September UFO, the Pansy block. As I mentioned earlier this one is a doozy. I'll be sewing it together on Sunday. Ticktock! The end of the month is looming closer. Kolonial is coming along nicely too. I'm in a holding pattern until the two time critical projects are complete (Crazy Cats and Pansy). I'm getting so close its hard not to spend time finishing it. When this project is finished there will be a happy dance when I post my Stash Report! So what have you been doing so far this week? Canyon Quilt Guild September monthly meets tonight. Nancy Brown is our speaker for the evening. She is known for her animal applique designs. I took a workshop at Road to California a couple of years back. Nancy is a delightful teacher. I appliqued from a photo of my girl cat Kaos. I used the block in my 50th Birthday quilt that was named Kwilt Klub Kattery. Kaos is in the top left corner. Don Linn also known as Mr. Quilt will be Canyon's speaker in October. The Sunday progress on Kolonial wasn't much. I did finish trimming the strip blocks and cutting off the dog ears on the last HSTs. I also found a neutral fabric with a pink cat print small enough to make one side of a HST. I also found three pink cat fabrics that I'll sew into the borders. Once I have my four Crazy Cats sewn I will be back to Kolonial. 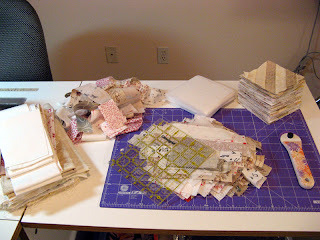 I still have a goal set to make a crumb block with Jo's Country Junction Crumb-Along. This Tuesday bring another block...already behind! I've got a link to her project on my sidebar if you want to get in on the fun too. Hope your design wall is filled with something fun. Check out other design walls at Patchwork Times. I begin this day with spiced pancakes which were sure delicious. Now I sit with my Laurel Burch cat mug full of Starbucks freshly ground coffee recalling my week since Wednesday. Thursday Bonnie brought me Temecula Quilt Company's Thank You participation gift for entry into their Red and White Quilt Show with Krimson Khat. It includes fabric and instructions for making a pincushion, two pencils, three maganets and an invitation to attend their Grand Opening on October 1st. Charmagne also added to my novelty collection of cat fabrics :)! 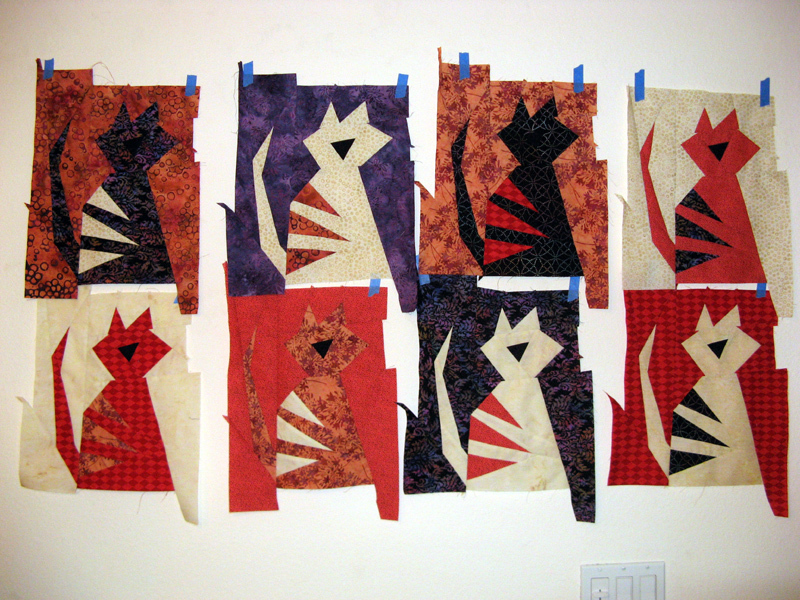 I don't always, but try to include a very subtle cat fabric in each of my quilts. This is a bit tricky because I've got to have the perfect color. This new assortment should help get me into a few quilts that I wouldn't otherwise. Thursday was the first workshop of Crazy Cats. This Buggy Barn pattern was definitely no walk in the park! These cats were certainly more difficult than the pumpkins of Crazy Jacks; but I can tell you too that they will be worth the extra effort. I'm getting the hang of these two sisters from Reardan, Washington. Pam Soliday and Janet Nesbitt that create The Buggy Barn designs are all to clever. Julanne Bergstrom is doing a great job getting the novices through the tricky steps. 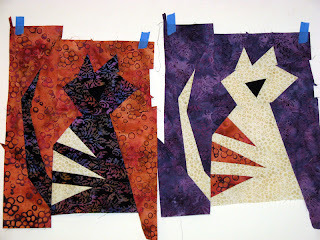 I was able to get two cats together at the four hour workshop at Amidon Quiltworks which also included the pressing, ordering of fabrics, the cutting and the shuffling of pieces. Shuffling involves moving one fabric of several pieces that make the stripe to the bottom of the same units and then moving two fabrics of several pieces that make the cat to the bottom of the same units. 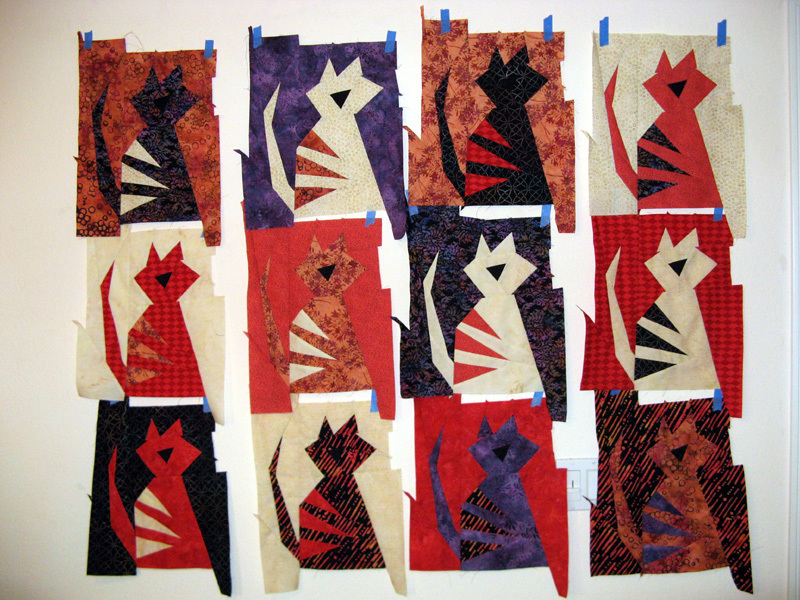 This process gets all the fabrics mixed up so that none of the finished cats are the same. 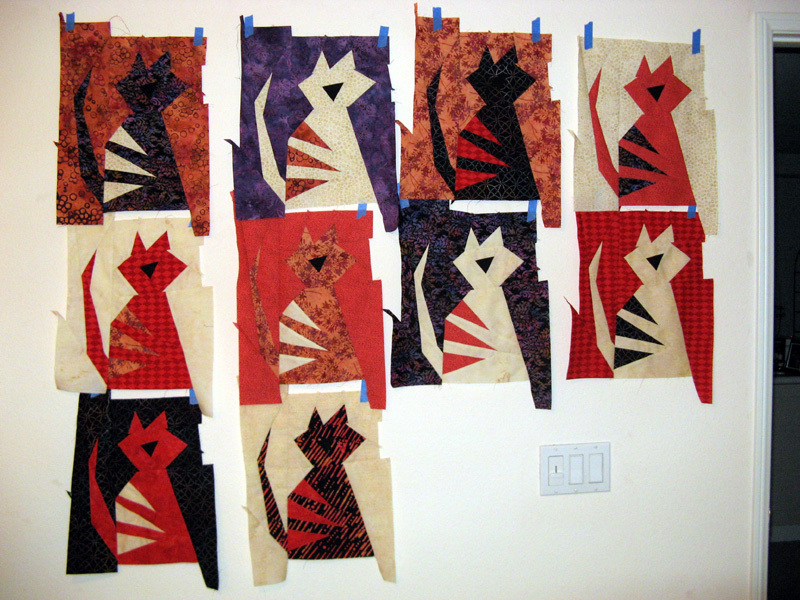 My assignment before the next workshop on September 29th is to finish the rest of the 12 cats. I got two more done on Saturday...now only eight more to go. This project has been all scraps until Thursday when this oh so perfect stripe literally jumped into my project...of course it was so perfect...the FQ had to stay :)! 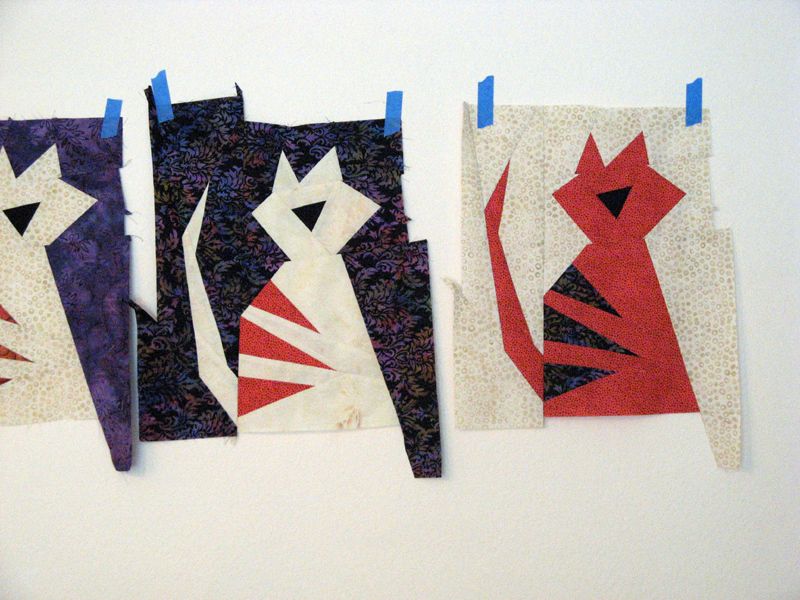 Wait until you see it; it is in one of the last cats...perhaps it will make it to my Design Wall tomorrow. Anyone want to wagger? Friday was my biweekly off day. I managed time to work on Kolonial the Bonnie Hunter Jamestown Landing design from the Australian Homespun The Blue Issue magazine that I'm doing in pinks and neutrals. 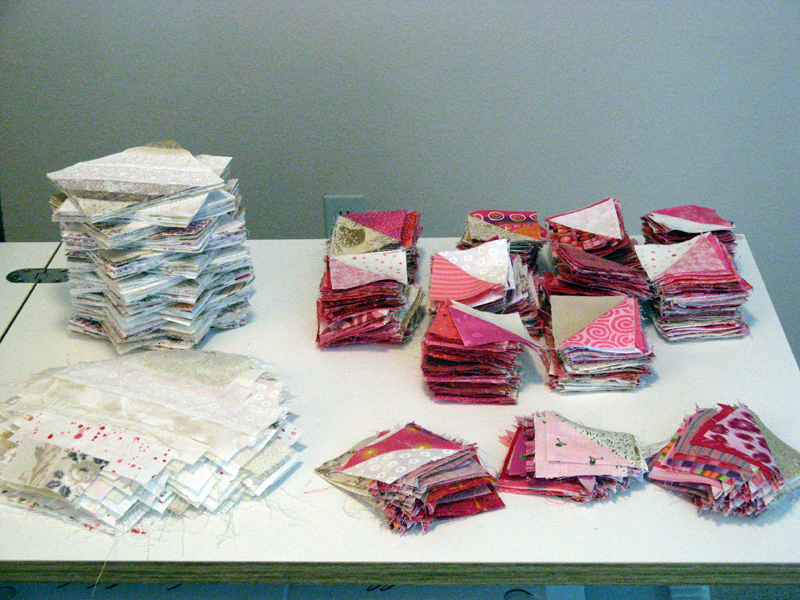 Now that's a lot of HSTs and its only about a quarter of the total! I really like the variety. I have all the components sewn together including all the string blocks. 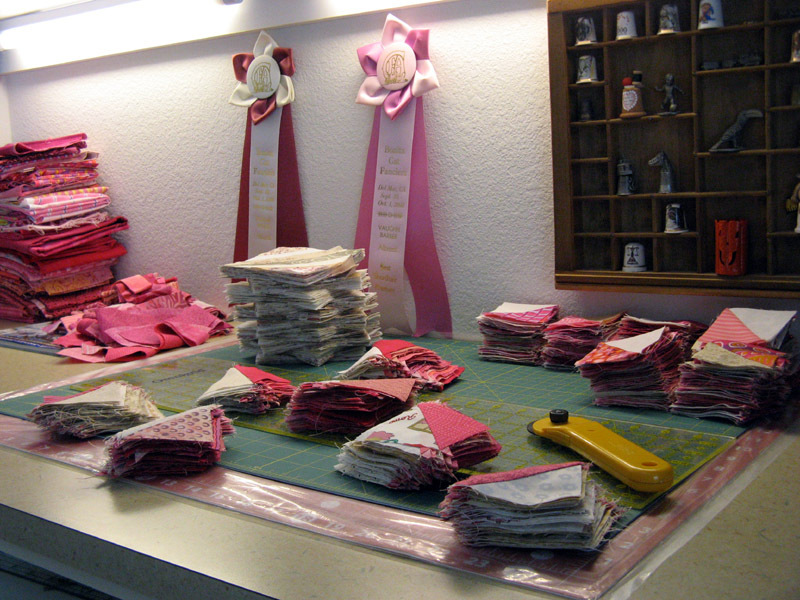 The four stacks in the front are pressed and ready to be trimmed (the HSTs are what was on the ironing board just pressed in the previous three photos). Once that is done I am ready to assemble the 15 of each 8.5" dark and light Jamestown Star blocks. I am hoping to find time to work on today. 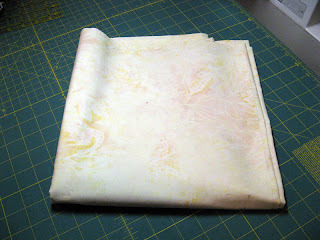 I have the Sunshine Quilt Guild's 2011-2012 Opportunity Quilt "If I Only Had A Brain" to share with you today. I've been offering chances for it since Wednesday. Its been doing rather well and why shouldn't it as adorable as it is. 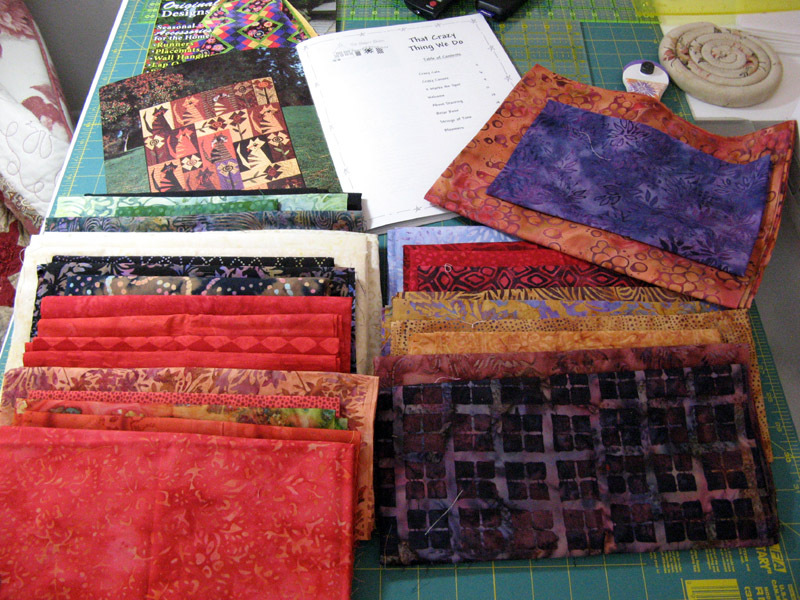 I'll be offering chances Monday night at Canyon Quilt Guild's September monthly meeting. I'll end with my stash report which I still can't report a use and I am taking away a FQ from my Net Fabric Used for a short time...that big week is looming ever closer when Kolonial will be counted and Crazy Cats will be right there too. 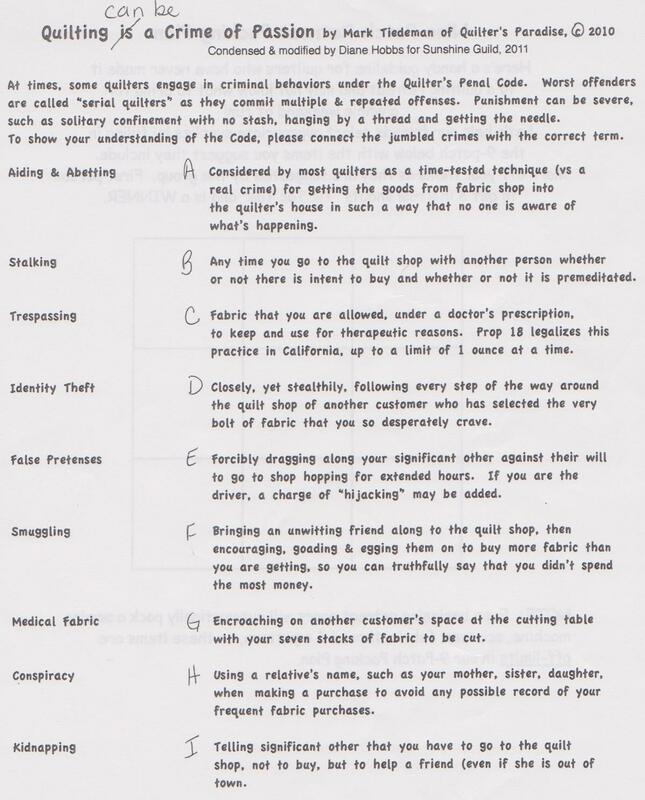 I almost forgot to give you the answers to the Quilting Can Be a Crime of Passion game that I gave you on Wednesday's Post. 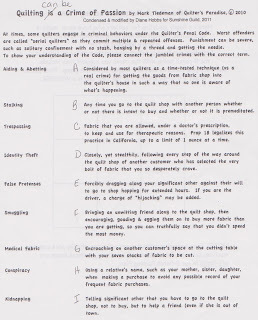 Starting with Aiding and Abetting and working down the "jumbled crimes" list here's the answers: F, D, G, H, I, A, C, B, and E. There is more fun with Mark Tiedeman of Quilter's Paradise on the website. 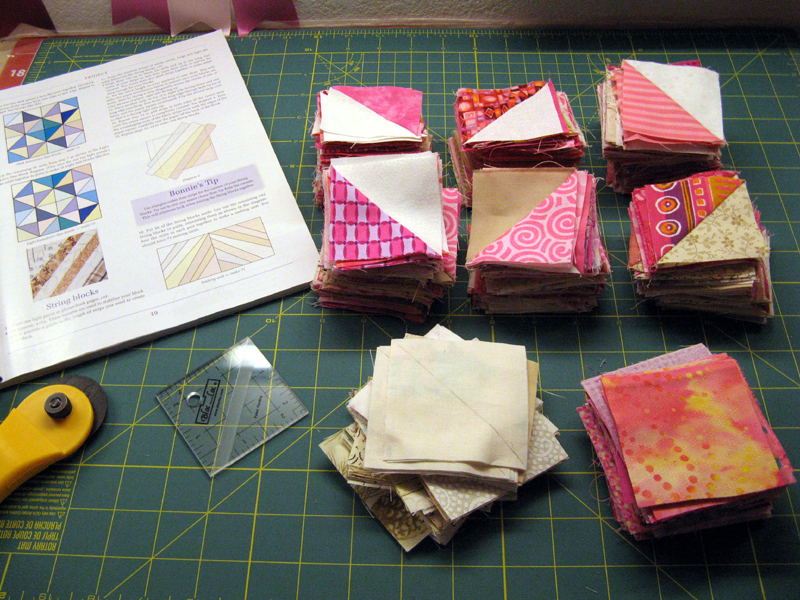 Tuesday night as I mentioned in an earlier post was Sunshine Quilt Guild monthly meeting. Crazy Jacks stepped out with a big bang! YIPPEE! It raised $67 for the evening. There is one more selling night and the winner is drawn at the October monthly meeting. We had our customary September meeting program to announce the officer for the coming membership year (I took on two responsibilities that were totally unplanned) and the Ice Cream Social. We had lots of fun with two games and the ice cream with all the wonderful toppings was a nice touch to our earlier dinner at Outback Steak House. 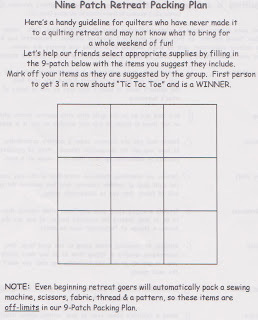 There is no right or wrong answer for the Nine Patch Retreat Packing Plan (which I took home a prize for a BINGO!). There are right answers for the Quilting can be a Crime of Passion game. I'll let you know them if you are interested in my Sunday blog post. I picked up the BOM for the month that will be due in October. It is a traditional Quilters Cache pattern called Sweet Gum Leaf where we were provided a cream batik for the background. We will choose a fall colored batik for the leaf. I'm getting ready to take another doll making class at Country Loft in La Mesa. It is scheduled for October 7th. I ordered some wool from Primitive Gatherings Quilt Shop that I'm hoping arrives in time. Wow...wool is much more expensive than cotton! 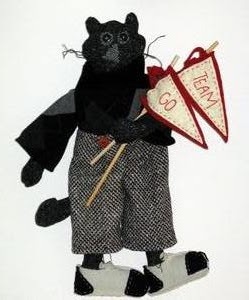 I have a gray and black cat dolls already. Kevin was my first and Koraline was last year. So this time I wanted to have an orangish cat (like my cats Kaos and Komotion). 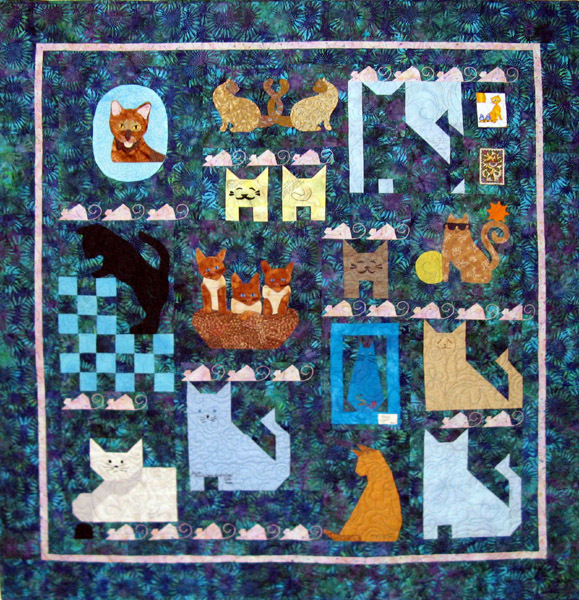 The pattern is KitKat Mama which has three kittens. I'll be making Mama and one kitten in the orangish wool, and the other two kittens gray and beige. Also picked up a couple of accent wools in indigo and periwinkle. Wish me luck on everything arriving in time. The orangish fabric is new and advertised as being available in September; we'll see. Haven't named Mama or her kittens yet. You do know that they'll all have "K" names :)! Finally my Buggy Barn Crazy Cats pattern's first workshop is tomorrow at Amidon Quiltworks. It was to be the second of two workshops for this pattern, but last Thursday's workshop was halted by the DARK SAN DIEGO power outage. Looking forward to this workshop with the rescheduled second workshop on September 29th. Yes indeed this has and continues to be a busy week! Happy sewing to you all. I am continuing to work on Kolonial. This is a Bonnie Hunter design called Jamestown Landing that was published in the Australian Homespun magazine "The Blue Issue". I got my issue from Erica's. Bonnie says that this pattern will be available in her next book, but if you can't wait as I couldn't...get a copy of the magazine. So here's where I'm at today. I am all pressed with the HSTs with a bunch still needing the "dog ears" trimmed off. A few HSTs are yet to sew together. About half of the strip blocks yet to assemble yet. I set a daily goal to get a minimum of 10 sewn that is working out so far. At this pace I should be putting blocks together during the week. 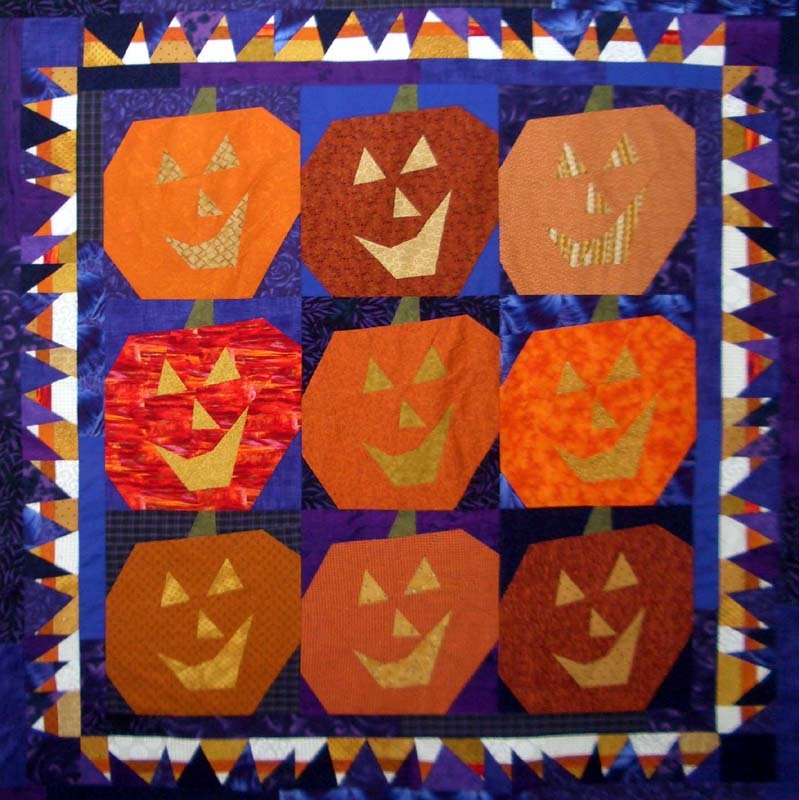 Tuesday night I have Sunshine Quilt Guild's September monthly meeting. 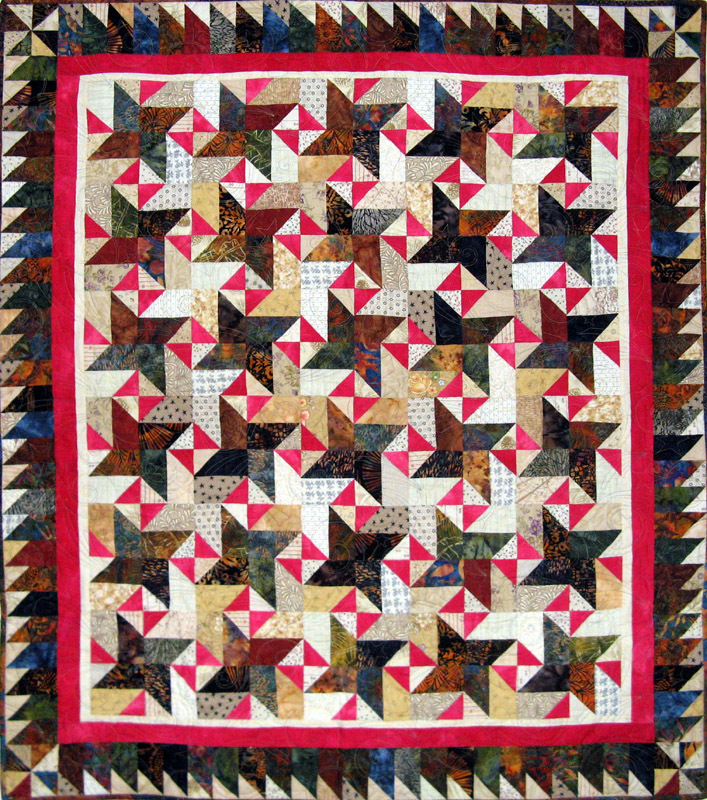 This is the first night of offering chances on Crazy Jacks bimonthly opportunity quilt. Kerry and I put Crazy Jacks together as our donation to the guild's charity fundraising for the membership year. That's my sewing week; what's in store for you? Today I remember like all of us that nightmarish day. That day my brother Mike was in the Pentagon. I'd not turned on the news but got calls first from my brother Steve then rapidly my Sister and Mom. Of course with the time difference in they were first to know that Mike was in jeopardy. It was horrible not knowing what would be. My family was fortunate as Mike was on the other side of the building. My thoughts go out to those that didn't get through this as we did. Why there ever needs to be such horrible individuals that wish to create such havoc to others we will never know. Stay vigilant. So last week was a crazy week for San Diego...the DARK Thursday night! I'd left a bit early from work; to pick up a few supplies and start a little preparation for the Crazy Cats workshop that and several others were scheduled to attend at Amidons Quiltworks at 5pm. There had been talk on the news about limiting electrical consumption during the hot weather we had been experiencing the days before and that day. When the lights flickered at Amidons and then went out, everyone assumed that it was a temporary thing that would right itself shortly. Well of course it didn't! The workshop was cancelled and will be rescheduled. Now I had to get home in the crazy grid lock traffic conditions throughout San Diego. It took me 1.5 hours to travel about 20 miles. Gosh it was good to be home! Sure was weird as the news was reporting to look outside and see pitch black where ordinarily you would see light. Our power was restored around 2am. After nearly 12 hours without correct refrigeration lots of things in the refrigerator needed to be thrown out, but besides the traffic getting home, it really wasn't too bad. Nice to see the stars and we did have a very full brilliant moon that night :)! On to news of my sewing studio. The 30th San Diego Quilt Show started Wednesday evening with a Preview Night. Eleanor Burns of Quilt In A Day was the guest speaker for the evening. Her impression of Marilyn Monroe was priceless. The quilts displayed this year were exceptional. I will be picking my three and Kerry's three up a bit later today. The show closed Saturday. I did very well through the Vendor Mall. 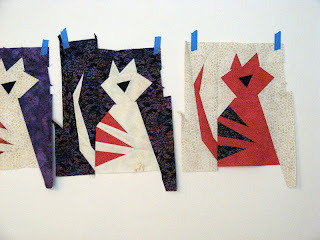 I purchased a few tools and only a little fabric for my Crazy Cats project. The fabric is in the top right, that pretty dark purple and an orange with a purple design. These will fill in a few gaps with the rest of the fabrics that I will be using. Not a bad report this week...and better yet what I purchased will soon be used! How well did you do? Check out others at Patchwork Times. I've got nothing to show on my Design Wall, but lots to show in my sewing studio in various stages. I'm working on Kolonial; my version of Bonnie Hunter's Jamestown Landing available in the Australian Homespun The Blue Issue magazine. I purchased my copy through Erica's. The magazine is a bit hard to find. HSTs sewn ready for cutting in half, etc. The pattern calls for 840 HSTs. 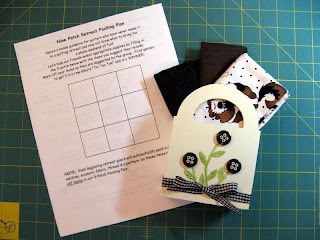 These go together faster than you'd think if you do them with assembly sewing. The longest part of the process is cutting off the dog ears! I've got half of them all finished and the remaining half (with the exception of about 40) sewn ready for the removal of the dog ears. The strip blocks are always quick. They use up so much thread and as long as you stay within the color family you can use just about any spool. I use a featherweight pelon as the foundation so I don't have to rip it away. It lays quite nicely in a quilt top; so much so that you'd not notice it to be present. There is a stack of strips already cut and another stack of neutrals ranging from white to beige to cut into yet. I've got 86 done of the 168 that is required. Probably safe to say I'm half way done with Kolonial. The outside border is a piano key design that uses 1" to 2 1/2" widths 5" long. I have a stack of these already cut and a tower of pinks to use if I need more. 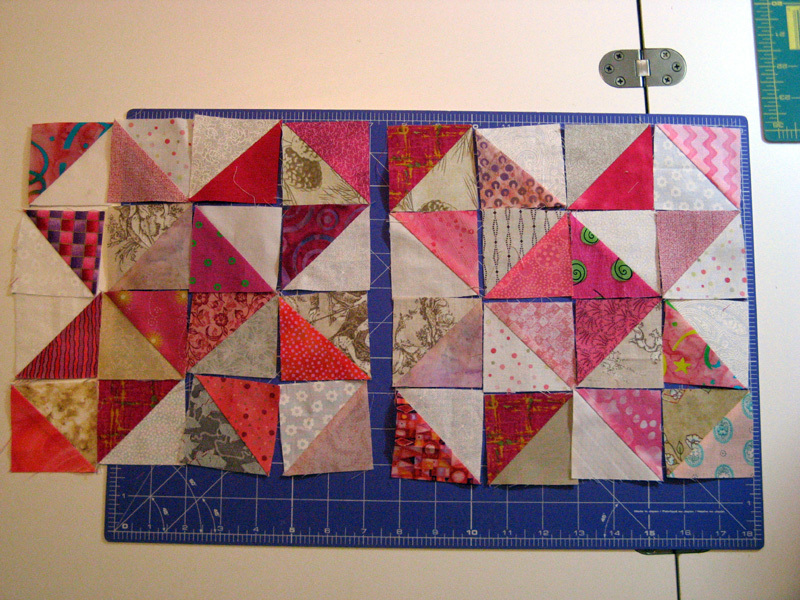 I'll be saving the larger pieces to use last as I'll need 10 1/2" squares for my scrappy back too. 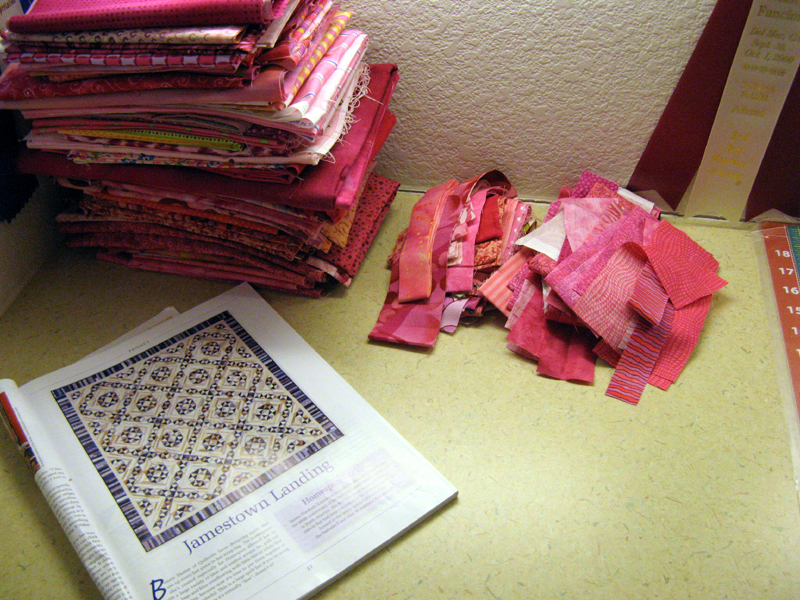 My pink/red stash is definitely a bit lighter for the fabrics that are being used with Kolonial. 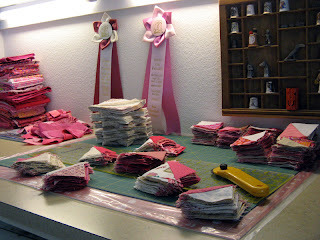 Today I have my three San Diego Quilt Show entries to drop off between 1 and 6pm at Rosies Calico Cupboard in La Mesa. The show will be hung on Wednesday. Look at yesterday's post if you want to see them. I'll be going to Preview Night on Wednesday evening. Entry is a bit higher, parking as I recall is a bit less, but the number one (and two) reason I like Preview Night is the less crowded show room and ticket sales support a local charity. Later this week I'll be collecting fabrics from my stash for my next Buggy Barn workshop with Julanne Bergstrom at Amidon Quiltworks in Poway. 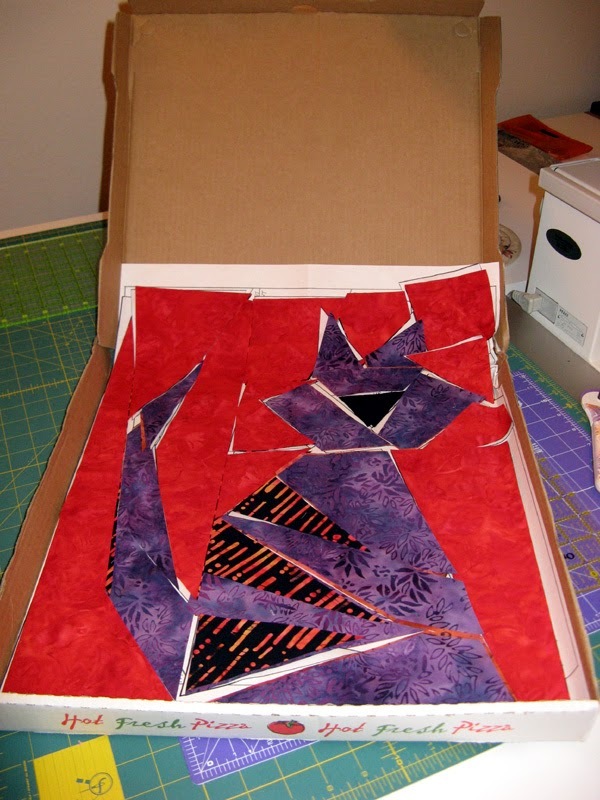 The workshop is on assembly of Crazy Cats from The Buggy Barn's That Crazy Thing We Do pattern book. There is always a UFO to be working on...but each of these are something new this year! What fun things do you have going on this Labor Day? Get a glimpse into other sewing studios today at Patchwork Times. Didn't this pattern by Buggy Barn come out cute? 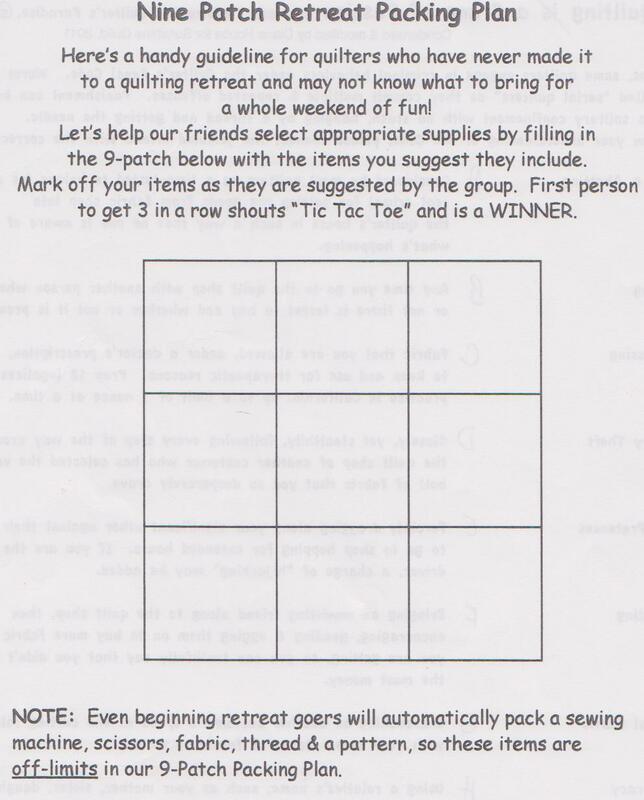 We'll be offering chances to win it in October at the Sunshine Quilt Guild's bimonthly opportunity quilt fundraiser. Kerry and I pieced it over the last couple of weeks. 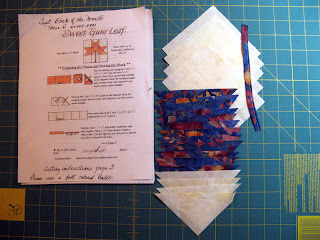 It's ready for quilting this week with a variegated orange thread in a swirly design. 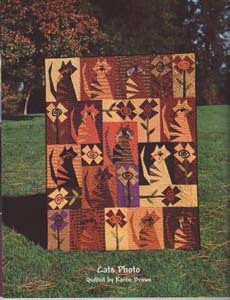 If you are interested in the pattern it is in the Frightfully Crazy pattern book called Crazy Jacks. The pattern book also contains three other great designs; the 3D If the Hat Fits with witches on brooms (their feet dangling off the broom stick). Tomorrow I'll be dropping off three quilts for the San Diego Quilt Show that is this week September 8-10. My entries are #146 Kandy Korn, #148 Kiwiberry, and #147 Krimson Khat. I have all three for sale...interested? Come check out the show if you are in San Diego. This week nothing purchased! This week 10.75 yards used! YIPPEE! Hope you had a similar week. Did you reduce your stash this week? See how others have done at Patchwork Times. Internet for nearly two full days. Mom's Birthday and their Anniversary on Monday. Finally today celebrating his Birthday. Wishing you many, many more Dad. I am happy to have Komet done. 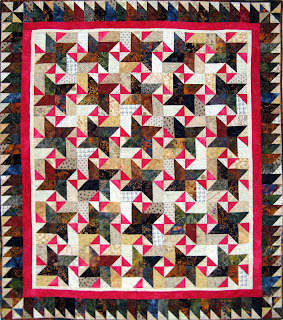 This is Bonnie Hunter's Star-Struck design taken at a Road to California workshop with her in late January of this year. The fabric choice for the binding was a bit difficult, but I think it has worked out perfectly. 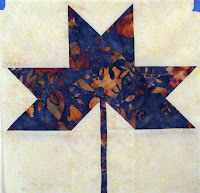 It's quilted in a stars and swirls pattern called Moonbeam with a variegated blue and yellow thread by Kerry's Quilting. Today is my OFF Friday...YIPPEE! Monday is also Labor Day (one of the rare company holidays). This of course all means a FOUR DAY WEEKEND! Hope you have a great sewing weekend as I plan to have. Judy at Patchwork Times selected #11 for September's UFO Challenge. My #11 is the Pansy flower block, which happens to be my most favorite flower. 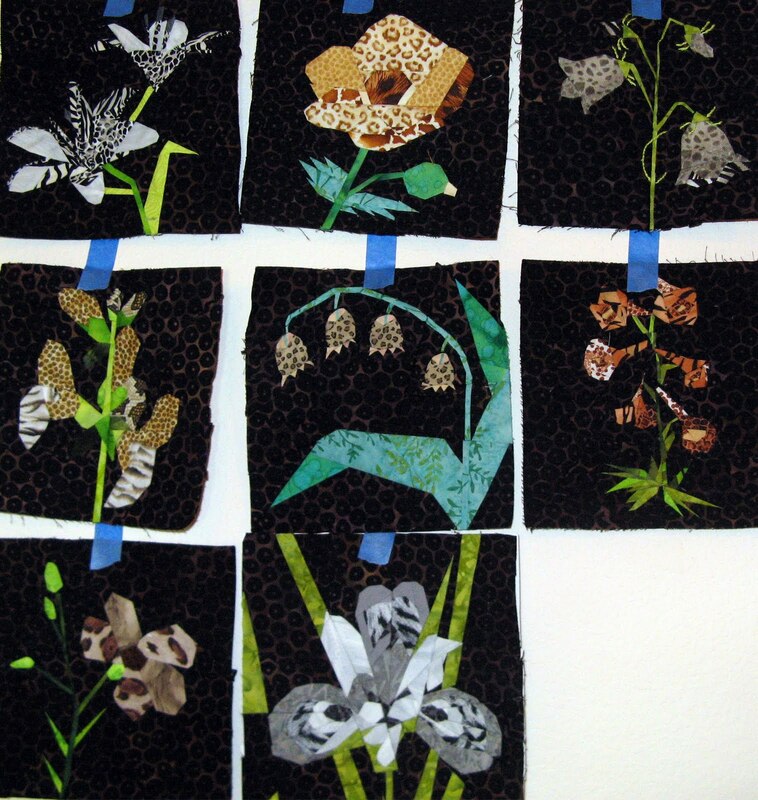 This is the ninth block of my animal theme exotic flowers project that will be called Kourageous. There are 23 Sections and 232 pieces OMG! Do you remember these are 6" finished blocks? One Section has 25 pieces in it alone (the yellow/purple petal at the 4 o'clock position near the two leaves at the bottom). This is another of Linda Causee's designs from her book 24 Flower Quilt Blocks. I'm starting to think of what colors need to be in the remaining flowers. What do you think? 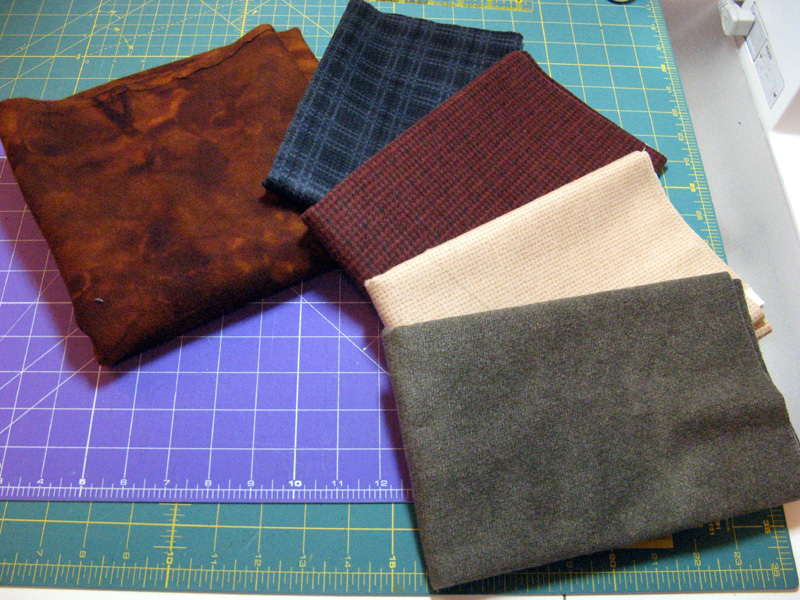 (Most of the fabrics I'm working with can be found on the Kourageous link.) Since there are two blossoms in this one block...what are your thoughts on making them two colors instead of one color? At the moment I'm thinking to stay with one color bringing out the lighter fabrics for one blossom and darker for the other, very much like what the designer did with the yellows and purples. I also think I need to add more of the brown red fabrics into the project similar to the Cranesbill (February) and Larkspur (June) blocks. I'd love to hear what you think. If you have a September UFO do get done this month I hope it's one you are excited to see finished. Check back again to see my progress. Let's start by saying I was sweating the completion of my August BOM with Patchwork Times this month. I had quite a lot to accomplish today, but...I finished in time (thank you Bonnie for thinking of me during your services tonight) and with only one major redo that happened on Monday night. I really like the flower design results with Linda Causee, but it would have been much better had she given a "key" to the fabrics. I've had a terrible time with what fabrics go where. I sew mostly in the evenings when the light isn't the best, which ends up with lots of difficulty in determining what fabrics go where. Okay enough, I've gotten through it and I'm leaving the paper removal to Bonnie tomorrow at lunchtime! I'll need to square it up after that of course. So I'm finished with all eight UFOs to date. Judy...I'm ready for September! Here's what Kourageous looks like so far. I've skewed the photo a bit so the Meadow Clary block isn't as skewed as it looks here and the Iris block still needs Bonnie and squaring up! 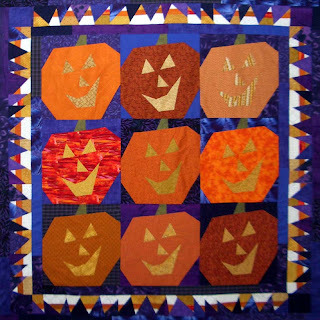 Check out other UFO completions for this month at Patchwork Times.